With my kart away at 'Chris Butcher Racing' being updated to the 2010 rulebook, the day was mostly about catching up with fellow drivers, the ongoing changes following the takeover and generally helping out. I took a few publicity photos before helping out with marshalling and repairs. Late in the day, I borrowed the kart of Carl Heighes to go out for my first few laps of the Birmingham Wheels track. It went ok and it was good to get back out again having not raced since October (and even then that was one race at Swaffham when I took it easy due to a back injury!) This was also my first drive in someone elses StockKart/StoxKart since owning mine! With my StoxKart updated to 2010 specifications (thanks to Chris Butcher Racing) this was the first meeting of the 2010 season and the first meeting following the re-launch of the StockKarts UK Formula under the new name of StoxKarts. Now under new ownership, the newly rebranded StoxKarts Formula took giant leaps forward during the close season and over 20 drivers were in attendance for round 1 of the National Points Championship sponsored by Print+. In near perfect conditions on a damp track, I made a bad start to heat one as I lost momentum on the outside line of the back straight which was not as smooth. I was then held up by a slow kart and ran wide losing further places before benefiting from an incident involving several karts on the home straight which brought out the waved yellow flags as a kart remained stranded across the track. On the restart I was in 13th at the rear of a group of six karts. I moved up to 12th before 10th and 11th had a coming together. I took avoiding action and moved up to 10th but had lost ground on 9th. I re-caught 9th just as the chequered flag dropped. At some point during this race the glass had fallen out of my inside rear view mirror! Rain began to fall just before the start of heat two and the remaining races took place in tricky conditions. I again got a bad start losing out when becoming distracted by hire karts jumping the start. It proved an ideal race to get the hang of my 'rip n roll' goggles which whilst delaying me slightly certainly helped give some visibility (not having an inside rear view mirror was certainly not an issue!) although I was also not helped by being close (but not close enough!) behind another kart! It also did not help that as I was passed by another kart at the start finish line I thought I had seen them be given the chequered flag and backed off thinking it was the end of the race! I gained places by passing karts and with karts spinning to finish unplaced (I think 12th). Heat three was very tricky with little visibility. I again lost momentum at the start by being stuck on what was now a very treacherous outside line on the back straight as hire karts again jumped the start. A crash on the back straight saw several karts spin out and I was able to negotiate a way past but this involved again losing momentum on the outside line before waved yellow flags brought the race to a halt. To avoid a kart half spinning I was forced onto the outside of the back straight before doing so again as two karts came together in front of me with one spinning. I was then nudged on to the same line before unfortunately finding it again to avoid a spun kart! Despite losing momentum everytime I was on the outside line of the back straight and being on the end of a few nudges with perserverance I kept going and I was able to gain places in a race where few karts finished. Although I was a lap down I was recorded on the lap sheets as finishing 4th. Conditions were no better for the final but I faired much better and was in 9th before putting the bumper to use for the first time on the day in nudging another kart. I was nudged on to the outside line of the back straight upon being lapped by the two leading karts. I was then on my own the remainder of the race and going ok. The kart that was 8th had a spin and with another kart going off I was 7th on the lap sheets, although video evidence suggests I was 6th, in a race where few karts finished. An interesting meeting, never had to concentrate so hard in a StockKart/StoxKart just to stay on track! Need to improve my race starts. Heat 1: unplaced (9th), Heat 2: unplaced (I think 12th), Heat 3: 4th, Final: 7th. POINTS: 16. With the cancellation of the Barford fixture on 11th April (still resulting in a trip up north due to booked travelodges and recovering Chris Butcher's kart that, due to the cancellation, had become stranded in Scotland!) this was the first tarmac meeting of the 2010 season. Three cleaning sessions following Coventry had got the kart ready as again over 20 drivers were in attendance for round 2 of the National Points Championship sponsored by Print+. This was my debut meeting at the Birmingham Wheels raceway although I had completed a few laps in the kart of a fellow driver at the pre-season test day. The meeting formed part of the second Incarace ‘I-factor’ series event. The meeting featured 7 formulae – believed to be a first at the Birmingham Wheels Raceway! On a fast dry track heat one featured two yellow flag incidents and although I was racing without an inside rear view mirror I made some progress through the field but finished outside of the places (I think 14th). Heat two saw a few karts non-finish and I also passed a few karts before being delayed and then nudged wide to be repassed by a kart. I again finished outside of the places (I believe 12th) in a race that highlighted how difficult it is to make up ground from the rear of the field in a short ten lap race! Having been overcast and threatened a couple of times, rain began to fall between heat two and the final. The tricky conditions made for the best race of the evening. I gained places as a few drivers found the conditions tricky and spun. I was at the rear of a group of karts battling for 5th and making progress. I was repassed by one of the recovering karts on the inside going into turn one before they ran wide on the exit enabling me to re pass. On the next lap the same kart raced pass down the outside going into turn one before again running wide on the exit enabling me to re pass again! With two karts tangling and then another kart spinning I was up to 7th going into the last lap. 6th nudged 5th going into turn one of the final lap enabling me to get up the inside of the kart now relegated to 6th going into the final bend. I managed to lean them out wide and claim the place to finish 6th out of 18 starters. A difficult meeting with the rain no doubt helping towards an improved result in the final. After staying over at a fellow drivers in the area: the following day I assisted at a StoxKarts corporate hire meeting followed by Junior testing and the 2010 Junior series round 1. Another 20 driver line up including two National Hot Rod drivers for round 3 of the National Points Championship sponsored by Print+ and Gold Top Qualifying round 1 sponsored by Teng Tools. The meeting doubled with Scunthorpe speedway practice with a reasonable sized crowd taking in the action. This was the debut meeting for the formula at Scunthorpe and became another new track that I had raced at. Heat 1 and 2 were run in tricky wet conditions and with a wide track it meant for many choices of racing line. In heat 1 I did not make the best of starts and was then compromised by hire drivers going all different directions around the first bend. I settled into a rythem and tried a range of lines to find out where the quicker dry lines were but finished unplaced (I believe around 10th - 12th). Heat 2 followed a similar pattern to heat 1 and I had a good dice with another driver. Learning from heat 1 and avoiding a few incidents I finished 8th. For heat 3 and the final the track had dried and was much faster. Heat 3 started with a first bend brush with the air fence avoiding two spun karts on the first corner! I made a few places and whilst closing on one kart another kart spun further ahead in turns 3 and 4 leading to the kart in front of me also taking a spin! Fortunately I managed to find a gap between the two but then came a yellow flag and although I was towards the rear of the restart this was due to drivers being lined up in position order rather than lap sheet order. I was on the pace but finished unplaced (I believe around 10th - 12th). The final saw a good dice with another kart. I passed them before they nudged me wide to re-pass. I eventually finished 8th. Combined with staying at friends in the area over the weekend the kart was cleaned up that evening and the following morning almost ready for the next meeting. Heat 1 and heat 3: unplaced (I think about 10th - 12th), Heat 2: 8th, Final: 8th. POINTS: 9. With the kart having been stored at our friends in the area since the previous meeting at Scunthorpe a small amount of work was required the day before the meeting. Another 20 driver line up for round 4 of the National Points Championship sponsored by Print+. The meeting featured National 2Litre Saloons, ORCi Ministox and Rookie Bangers in front of a reasonable sized crowd taking in the action. This was my debut meeting at Skegness and I lined up for practice but due to a limit on the number of karts allowed on track did not make it out and so heat 1 effectively became practice. I passed a kart on each of the first two laps that had pulled off / crashed and then another that had pulled off halfway through the race. I generally made little progress not helped by running wide on a bumpy surface around turns one and two on lap 7. I re-closed up the gap to the kart ahead but it was too little too late and I finished unplaced (I believe 17th). It rained prior to the start of heat 2 making for tricky wet conditions and following previous good results in the wet I was fairly confident. Unfortunately, as the green flag dropped I collected a spun kart on the exit of turn four launching my kart up and over the side of the other kart (see videos below)! I passed two karts that were delayed by seperate incidents as a yellow flag followed with the kart I hit stranded across the track! On the restart, in thinking that there would be a full lap before the green flag dropped, I was busy checking whether the kart was ok and lost ground! I passed two karts but was generally delayed by another kart that was struggling for grip and looking close to spinning on a few occasions. Concerned with what damage may have been caused by my crash I resisted getting too close and using the front bumper which in hindsight, on finding minimal front end damage, was a mistake. To make matters worse, I was then passed around the outside by a kart on the last bend and finished unplaced (I believe 15th). I reverted to my preferred wet weather tyre pressures for heat 3 as the track was still wet and had my best race of the meeting. I passed three karts in the early laps that had stopped / spun and then had a good battle with another kart passing, being re-passed when I ran wide around turns one and two, before re-passing again. I passed another kart before the end but again finished unplaced (I believe 15th again). I estimated how much the track had dried ahead of the final and still with my preferred wet weather tyre pressure settings I struggled for pace, was lapped and finished unplaced. Results were disappointing but combined with staying at friends in the area over the weekend it was not all bad. Heats 1,2, 3 and final: unplaced. POINTS: 0. With the kart cleaned up and the side of the wing sprayed Blue around the edge it was off to the Peak District for round 5 of the National Points Championship sponsored by Print+ and round 2 of the Gold Top Qualifying sponsored by Teng Tools. The meeting was a private hire at the trickly little shale circuit and with 18 karts the drivers were split into 3 groups with heats split into 2/3's. I was in the first 2 heats. I decided to experiment with higher tyre pressures for heat 1 which went well. My plan was to follow a driver who goes well around Buxton as they were on my inside in Blue. Unfortunately (or fortunately!) they pulled off with a split chain at the start of the rolling lap! I made and ok start and as the race settled down I was 6th before overtaking two karts battling each other and moving up to 4th before those karts came back past. Going into the final bend those two karts in front looked as though they were going to tangle so I backed off ready to take advantage not realising that a kart was behind which pushed me wide, came past and I finished 7th. Heat 2 was another good race and I timed my start better to get momentum up the slight hill of turns 3 and 4. I finished 7th and was on the pace only losing ground on the karts in front when I ran wide around the tricky turns 3 and 4 towards the end. The track was watered before heat 3 with all the karts being covered in shale so I was glad I missed that one! The final started badly as I tried to time my start down the back straight so as to get some momentum into turns 3 and 4. Unfortunately I went too early and had to ease off and when the green flag dropped I was on the outside in the marbles with no momentum up the slight hill and was soon swamped by the karts behind. I fought back up the places overtaking a few karts and gaining places from spun karts. I was just behind another kart and was trying to nudge a way past. I got alongside coming off the final bend but lost out by a half kart length. When the results were revealed I found out that this was the battle for 10th and so I finished 11th and just outside the points. I decided to not race in the Grand National as it was non-points but this was more to protect a mild back problem and also to avoid any damage that would have put being on track at the next meeting in doubt due to limited time to get it fixed. I enjoyed the meeting and being in blue grade felt like I was much more in the thick of the action. Heat 1: 7TH, Heat 2: 7TH. Final: unplaced (11th). POINTS: 4. With the kart cleaned up following Buxton round 6 of the National Points Championship sponsored by Print+ took place at Coventry. Following my reasonably successful experiment with higher tyre pressures at Buxton I went with the same at Coventry. For heat 1, run on a watered but drying all the time track, I started from the front of the blue grade and made a good start passing two karts on lap 1 and another on lap 2 to move up to 5th place. When another kart pulled off on lap 4 I was up to 4th. I was delayed by a half spinning back marker on lap 5 which saw another kart close and push me wide on lap 6. I was delayed trying to go around a hire kart on lap 7 enabling another kart to pass and when I ran wide to avoid a stranded kart on the same lap it enabled another kart to close and push me wide to pass on the last lap. I finished 7th. For heat 2 the track was drier and I started at the back of the blue grade. I made a poor start with karts not staying in grades before being brought to a stop so I was expecting another rolling lap and not the green flag to drop! I lost several places on lap 1 before making up two places with crashed karts before I was passed by another kart at the end of the lap. I was 12th after 2 laps having pushed wide and re-passed the kart that passed me at the end of lap 1. I passed two more karts on lap 3 and another on lap 6. I was passed by a kart on lap 8 trying to go around a hire kart which I passed on the next and penultimate lap. I eventually finished 13th. For heat 3 the track had been watered resulting in trickier conditions and I started in the middle of the blue grade. I lost out a few places on lap 1 and at the start of lap 2 but gained a few places when two karts clashed and ended lap 2 in 14th. I made more places on the next lap as a kart spun in front of me and when two karts crashed before being passed by a kart at the end of the lap. I was up to 13th before passing another kart and gaining places when three karts hooked up and went fencebound off turn 2. I passed another kart on lap 6 as a kart went wide around a stranded kart on turn 4. I went wide to pass a spun kart on the 8th and penultimate lap and a kart passed me. I nudged them on the next bend only to glance off forcing me to go wide around the stranded kart on turn 4. I finished 9th but video evidence suggest I may have been 8th. For the final the track was once again drying on the racing line and I started at the back of the blue grade. I decided to hang back at the start but the green was waved earlier than the previous heats and I lost ground. I still managed to pass 4 karts on lap 1 with two karts coming together in two separate incidents although I was passed by one kart and ended the lap 10th. On lap 2 I passed a kart that had stopped only to be passed by four karts and I ended the lap in 13th. I was passed by another kart on the next lap into 14th and tracked and nudged that kart for three laps making up one place along the way into 13th. I lined the kart up going into turn 3 on lap 6 and pushed them wide only to nudged at the same time by the kart behind. I half spun before recovering but I had lost ground and was down to 14th. I made up a place with a kart pulling off on the next lap but lost a place on the next and 8th lap. I moved up to 13th on lap 10 pushing a kart wide through turn 2. On the 12th and final lap the glass fell out of my inside rear view mirror for the second time (following heat 1 at round 1) in the season at Coventry! I enjoyed the meeting and being in blue is certainly an eventful place to start! Heat 1: 7TH, Heat 2: unplaced (13TH), Heat 3 (unplaced) 9TH, Final: unplaced (13th). POINTS: 2. With the kart cleaned up following Coventry this was my debut meeting at the Northampton International Raceway for round 7 of the National Points Championship sponsored by Print+ and round 3 of the Gold Top Qualifying sponsored by Teng Tools. The meeting formed part of the fourth Incarace ‘I-factor’ series event. On a dry and very fast track I went out in practice and was off the pace not helped by twice driving through a big hole on the exit of turn two. I upped my tyre pressures for heat 1 which started well but I lifted off as it looked as though two karts were going to come together right in front of me on the exit of turn 4 and was soon swamped by karts and relegated down the order. I passed two crashed karts and then battled past a couple but was also repassed by one of the earlier crashed karts. Other karts non-finished but I was unplaced around 14th. Heat 2 started better but I was pushed wide and every time I reslotted into the order seemed to be pushed wide again! I passed karts but eventually finished unplaced around 13th. The final followed a similar pattern to heat 2 before a three kart crash brought out the yellow flags. I passed a couple of karts before losing drive going round turns 1 and 2. I realised that my chain had fallen off and so I pulled on to the infield for a non-finish. A frustrating meeting with a need to find a set up that works on dry tarmac. Heats 1 and 2: unplaced (I think 14th and 13th respectively), Final: DNF. POINTS: 0. The meeting was a private hire at the trickly little shale circuit and with 24 karts the drivers were split into 3 groups with heats split into 2/3's. I was in the first 2 heats. After the experiment of higher tyre pressures went ok at the previous Buxton I decided to continue with this approach. Heat 1 went well with a good start helped by looking for when the start marshall waved the flag to start rather than judging my start based on the karts in front. I spun a kart on the first bend and passed two karts that clashed on the exit of turn two and was up to 4th. I ran wide round the next bend and was down to 5th after lap 1. I was passed by a kart on lap 2 and on lap 3 I passed one kart only to be passed by two other karts! I was in 7th where I stayed for the remainder of the race. Heat 2 again went well with a better start than normal again. I passed a kart on the start straight and another on the back straight and was up to 5th after lap 1. I passed another kart round turns one and two and was 4th after lap 2. I nudged the third place kart into turn three on lap 3 but did not find a way past and was passed up the inside by a kart down the home straight. I was still on the outside going into turn one only to find a kart stranded in the middle of the bend. I had to detour around the outside to avoid and lost three places as a result and was down to 8th. I was passed by a kart on lap six down the back straight and was out of the points in 9th. I fought back to pass a kart through turns one and two on lap 7 and then passed a kart that ran wide and hit the fence on the exit of turn two on the ninth and final lap to finish 7th again. This meant that in four heats at Buxton I had recorded four 7th place finishes! I qualified for the 20 kart final but the track had now been watered. I decided to try the same tyre pressures but in hindsight this was probably a mistake. I made a bad start and was passed by three karts early on. I passed a spun kart on the exit of turn two but was delayed doing so and passed by two karts. I was 13th after lap 1. I was passed by another kart on lap 2 and was down to 14th. A spun kart on the exit of turn two on lap 4 scattered karts but I found a way through to make up 3 places into 11th. This was as good as it got as I was then passed by a kart to be 12th after lap 4. I then half spun on the exit of turn two on lap 5 was hooked by another kart propelling both of us into fence. I ended up stranded across the track but managed to head the wrong way into turn two and park up on outside before rejoining a lap down. I half spun again at the same point on lap 7 and decided to pull off rather than continue struggling and potentially damaging the kart when I was out of the running. I decided to not race in the Grand National as it was non-points but this was more to avoid any damage that would have put being on track at the next meeting in doubt due to limited time to get it fixed. I enjoyed the meeting - the heats more than the final! Heat 1: 7TH, Heat 2: 7TH. Final: DNF. POINTS: 4. 25 drivers were in attendance for round 9 of the National Points Championship sponsored by Print+. The meeting formed part of the fifth Incarace ‘I-factor’ series event. Rain two hours before the meeting left the track wet for practice and alhough I did not go out reports from fellow drivers suggested a very slippery surface. Based on this I set my tyre pressures for wet weather only to find that the track had dried by the time of our first heat! I was off the pace and headed backwards through the field and although I did pass a few karts, including one late on out of turn two that came back with a big push going into turn three, I finished unplaced. I changed my tyre pressures for heat 2 and was more on the pace from the start but I pushed a kart going into turn three only to glance off and go out wide enabling a few karts to pass. I passed a few spun karts and held off another kart for a few laps before they passed. I again finished unplaced possibly around 14th. I was again on the pace for the final and at one point was upto around 6th place. A yellow flag for a big crash closed the grid and I was shuffled down the order but was going ok in several battles with the racing extremely quick. I slowed to avoid a spun kart on the final bend only to suffer a heavy hit on the rear wheel corner that dislodged the chain on my kart. I freewheeled down the home straight and over the line but finished unplaced believed to be 14th. Heat 1: unplaced (unknown), heat 2: unplaced (possibly around 14th), Final: unplaced (believe 14th). POINTS: 0. Due to house moving issues, I missed the Scottish Championship weekend at Crimond including National Points Championship rounds 10 and 11. 28 drivers were in attendance for round 12 of the National Points Championship sponsored by Print+ and Gold Top Qualifying round 5 sponsored by Teng Tools. The meeting was the first part of a StoxKart summer Skegness double-header centred around a camping holiday. Raining throughout the meeting meant for a wet and greasy surface. I completed repairs to the kart and just made it out on track in time for heat 1 and ran wide into turn 1. I was faced with two spinning karts which I negotiated a way past but lost several places. I got into a rhythm and passed a few karts back. I was pushed wide into turn three by a kart that passed and then spun out of turn four. I finished unplaced possibly around 14th. Heat 2 went better and I avoided several incidents and was well placed on the tail of the leading karts but made an error through turns one and two and then through turns three and four and lost ground to the karts behind. Some of these karts then passed and I finished in 10th place. In the final I was in amongst the Blue grade drivers into lap 1 before being pushed wide into turn three and passed by a few karts plus avoiding a spinning kart. On turn two of lap 2 I avoided an incident including another spinning kart before running wide into turn one on lap 3 and being passed by a kart. On lap 4, I passed a kart and also a stranded kart on the exit of turn four. The stranded kart resulted in a yellow flag which I did not originally notice and I passed two karts. I moved over to let these karts back past only to be passed by four karts! I ran wide on the restart trying to get a run on the karts directly ahead which did not work out and I was passed by a kart. I was passed by another kart on lap 7 and although I was on the rear of the karts ahead for the remainder of the race I was unable to get quite close enough to use the bumper and I finished unplaced down the order. Heat 1: unplaced (possibly around 14th), heat 2: 10th, Final: unplaced (unknown). POINTS: 0. Round 13 of the National Points Championship sponsored by Print+ was the second part of a StoxKart summer Skegness double-header centred around a camping holiday including disrupted sleep due to a mixture of rain, wind and loud music! Despite a rain shower in the morning, the track was dry for heat 1 and I was pushed wide into turn three on lap 1. I ran wide and avoided a incident with a kart being spun. I was on the outside going down the home straight and due to the poor standard of the surface in the middle of turns one and two I decided to go around the outside but unfortunately an out of control kart ran wide and spun in front of me and in swerving to avoid I crashed into and became stuck against the armco. I thought the kart was damaged and received a tow off the track by a tractor only to find that the kart was actually ok! I did a warm up lap before heat 2, which was again run in dry conditions, to check the kart was ok. I took it a little easier to ensure the kart was ok but generally I struggled for pace. I was again pushed wide into turn three of lap 1 and then was slowed on the home straight as a kart spun with another sent off course onto the inner kerb before rejoining right in front of me around turns one and two. I was passed by one kart before I passed a kart. I was towards the rear and making little progress but did pass a kart that was out at the start of lap 5. I was passed by the earlier spun kart through turns one and two on lap 6 but passed two karts crashed against the fence on the exit of turn two. Also on lap 6 I passed a spun kart on the exit of turn four but generally the race was not good and I finished unplaced. Rain had returned and the track was wet for the final and very greasy with the addition of mud brought on to the track from the centre green. On the wet surface I ran wide through turns one and two on the first lap and was passed by several karts but I passed a half spun kart on the exit of turn four. On lap 2 I passed a spinning kart on the exit of turn two and then another kart pushed wide in the same place on lap 3 before passing another kart along the back straight. I was going ok again in wet conditions and the exit of turn two was proving tricky as I passed another spun kart on lap 5. I was passed by two karts on the exit of turn four on lap 6 but made two places back as two karts came together on the exit of turn two on lap 7 before another two karts that had come together on the exit of turn four on the same lap. On lap 8, I was pushed wide on the exit of turn two and passed by three karts but I recovered to pass another kart along the back straight before passing a kart pushed wide and a spun kart on the exit of turn four. On lap 9 I was delayed through turns one and two by a half spinning kart before being passed by two karts and then collected and half spun by a third and passed by another. I was then a lap down and spent laps 10, 11 and 12 keeping out of the way of lapping karts. I was re-passed by a kart on lap 10 which I duly passed as they spun on the exit of turn four on lap 11. I finished unplaced but it had been an eventful race. After the meeting we returned to the campsite to find our tent had blown down along with another drivers and over food that evening I discussed potential problems with my kart giving me ideas to hopefully increase speed for the next outing. All in all an eventful few days away with the highlight being the 10th place finish on the Thursday! Heat 1: DNF, heat 2: unplaced (unknown), Final: unplaced (unknown). POINTS: 0. Due to various house moving issues including the kart not being ready, I missed National Points Championship round 14 a week earlier at the Northampton International Raceway. Unfortunately, I also missed this round at the Brandon Stadium, Coventry due a nail embedded in one of the trailer tyres resulting in finding a puncture when removing the trailer from the garage! Clare and I replaced the tyre with the spare which also had a problem so we decided not to risk taking the trailer, especially as there was now no spare! We travelled up anyway to watch and help out (including lap scoring the two private hire heats) and the meeting ended up being very muddy with the third heat being run as part of the proper Stock Car meeting on the outer infield which caused all sorts of problems...so a blessing in disguise perhaps? Due to the Coventry Stock Car lap scorer not turning up Clare and I, as StoxKart lapscorers for the afternoon, were asked to step in and lap score for the full meeting proper - Unlimited Street Bangers, Micro Street Bangers, V8 Hotstox (although we mostly left those to the transponders) and StoxKarts! 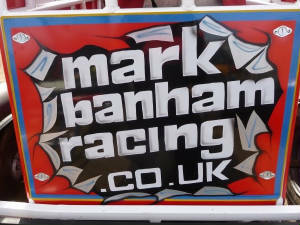 13/11/2010: BIRMINGHAM WHEELS - GOLD TOP CHAMPIONSHIP, NATIONAL POINTS SHOOTOUT FINALE, I-FACTOR SERIES FINAL. Having taken a break during October due to a house move and to get the kart and trailer in order (including a new air filter on the kart and two new tyres on the trailer) I returned for the season ending Gold Top Championship meeting combined with the National Points Shootout finale and the I-factor series final. Almost 30 karts started the Gold Top Championship race and having lost a pre-meeting coin toss with a driver on the same points I lined up on the outside of row 10. The build up was good and with up to five rolling laps it became clear that we were going on the fourth. The race went ok considering I hadn't sat in the kart let alone raced it since the end of August! I managed to steer clear of the incidents including a kart hitting the home straight armco hard just in front of me. A second yellow flag late in the race kept me on the lead lap and with 15 finishers I was the last kart on the lead lap in 13th/14th place. In the first heat I was third for a lap and a half before being pushed wide going into turn three and I dropped down the order. I recovered and was following two karts having a battle and as these ran wide around turns three and four I seized the opportunity to catch and pass and finished around 15th. In the second heat, I again made an ok start passing a few karts before again being pushed wide going into turn three and dropping down the order. I finished around 17th. I lined up for the I-factor final I believe on the inside of row 8 but my race did not last long as following an incident on the home straight just after the start I was forced onto an inside 'speed bump', took off and nosedived before landing heavily. Luckily I was just winded and a yellow flag for another driver stranded in a dangerous position enabled me to climb out and catch my breath. GOLD TOP CHAMPIONSHIP: 13TH/14TH, Heat 1: believe 15th, heat 2: believe 17th, I-FACTOR SERIES FINAL: DNF. POINTS: 0. What a difference! The re-launch of the StockKarts UK Formula under the new name of StoxKarts and with new ownership meant that the formula took giant leaps forward since the end of the 2009 and was the fastest growing short oval formula of 2010. 20+ karts regularly in attendance and 34 drivers listed on the final National Points Championship chart. This obviously meant that the racing was much harder and at times tough going with a drop down the grades during the season to Blue and then Yellow. At the same time though it was good to be part of a formula gaining credibility all the time and mostly knowing when and where the next meetings were going to be! It also led to new tracks being raced in Birmingham Wheels, Northampton, Scunthorpe and Skegness. The learning during 2009 helped at the start of 2010 before a house move, additional work commitments and trailer maintenance towards the end of the season meant a few missed rounds (unfortunately including the Crimond 'Scottish Open Championship and Bannock Burn Bash Trophy' weekend) but it was good to get back out for the Gold Top Championship final and then to finish the race itself! 47 points for the National Points Championship with 35 of those coming on shale and 12 on tarmac - and even then it was very wet tarmac! The season highlight was those 12 tarmac points from a 6th place finish in the round 2 final on my debut at Birmingham Wheels. I will begin the 2011 season graded as Yellow.